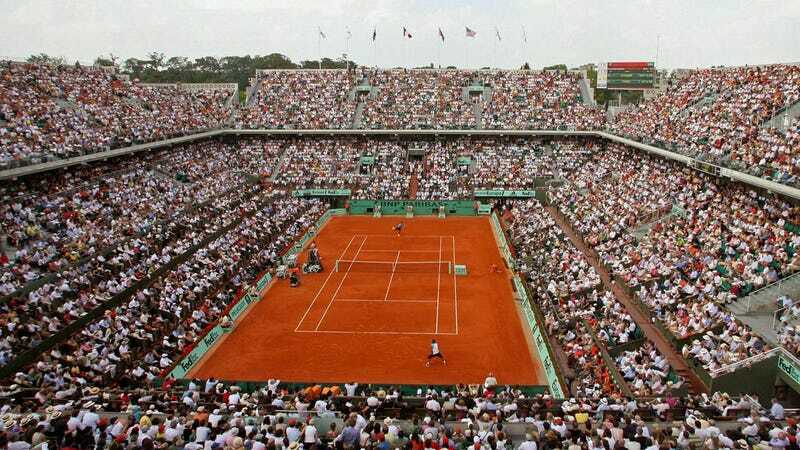 On Sunday, the 180 delegates of the French Tennis Federation will meet to decide the future of Roland Garros Stadium, which could change locations by 2016. This has fueled a wonderfully pretentious debate on the merits of the two possible outcomes: shall the century-old tournoi remain in posh western Paris, next to the lovely Bois de Boulogne, or shall it move to within walking distance of the Palace of Versailles? The primary argument for keeping it in Paris, explains Christopher Clarey in The New York Times, is that "Paris is Paris." Yes, quite. But! Roland Garros is considered a really terrible place to watch a tennis match. There are apparently obstructing vines (even the obstructions are pretentious), long lines, and overly crowded paths. The Federation may vote to move the Open to the suburbs, which are a very different kind of posh. Gonesse, Marne-la-Vallée, or Versailles are all in the running. The Paris option remains the frontrunner, though, because of both finances and the French predilection for "tradition and centralization." Haussmann lives! Rafael Nadal has said that if the tournament moves, it will lose some of its "soul," and two-time retiree Justine Henin said it would leave her with "twinges of regret." They are both callously ignoring the nearby endangered botanical gardens! If it stays, the plan is to build a retractable roof over the main Philippe Chatrier stadium, and the Paris municipal authorities have approved a proposal that would permit the tournament to expand from its current 21 acres to about 33, and allow construction of a small stadium in the adjacent botanical gardens, les Serres d'Auteuil. But those gardens predate the stadium by about two centuries, and thus win our pretension-off; already, 35,000 people have signed an online petition to protect them from the "tennis intruders." Clarey makes the point that all of the other Grand Slam host sites have moved their playing facilities over the years, as the sport has become both more accessible and more marketable, and they've done so at the expense of those sites becoming "more soulless." Tennis is tennis, after all.